A typical CSR page. This one is from Comics Gallery 1. This is the Index Page to Comics Gallery 1. Click on the thumbnail image (not active in this screen print) to be taken to the desire page. Technically, the term "index page" should be reserved for the page in a website's root directory, but I'm using it here because it describes the indexing function these pages perform at CSR. One of the "radio buttons" that link to the index pages. Below you will find the complete list. In addition to the five picture galleries already discussed, three non-pictorial departments - ARTICLES, FICTION, and VIDEOS AND GAMES - have index pages with descriptions and radio buttons that look very much like those on the HOME PAGE. The first two don't have thumbnail pictures because the individual pages aren't pictorial in nature, but VIDEOS AND GAMES has a still-frame for each item (page) to give you some idea what to expect. In a few cases, there are Special Features indexed in COMICS GALLERY 1 and HUMOR GALLERY that link to pages within the Articles Section (also indexed there), but the principle is the same. The LINKS index page is similar, but there the hyperlinks take you to external locations on the web. EVENTS and FOR DESERVING WOMEN are self-contained individual pages that do not require an index. E-MAIL THE WEB-ED is a standard mail-to button, which means it will compose an email automatically addressed to me using your default email client. COMICS SPANKING DATA BASE and FORUMS take you to special pages that are not structured like the ones we've been discussing here. They're easy to use, though - check them out! Here is the complete list of the various departments at CSR as we have been discussing them and largely as you will see them back on the HOME PAGE. "Date updated" has been replaced with a description. To go to a particular department, just press the associated button. These buttons are active here, although they're intended to be primarily for demonstration purposes, and you can just as easily use the ones on the HOME PAGE. ARTICLES - Understanding the Whys and Hows of spanking Just articles, some with illustrations. COMICS GALLERY 1 - Spankings from comic books, comic strips, comics art, and cartoons [spanking art] Mixture of actual comics and "fan art". COMICS GALLERY 2 - More Spankings from comic books, comic strips, comics art, and cartoons [spanking art] Mixture of actual comics and "fan art". 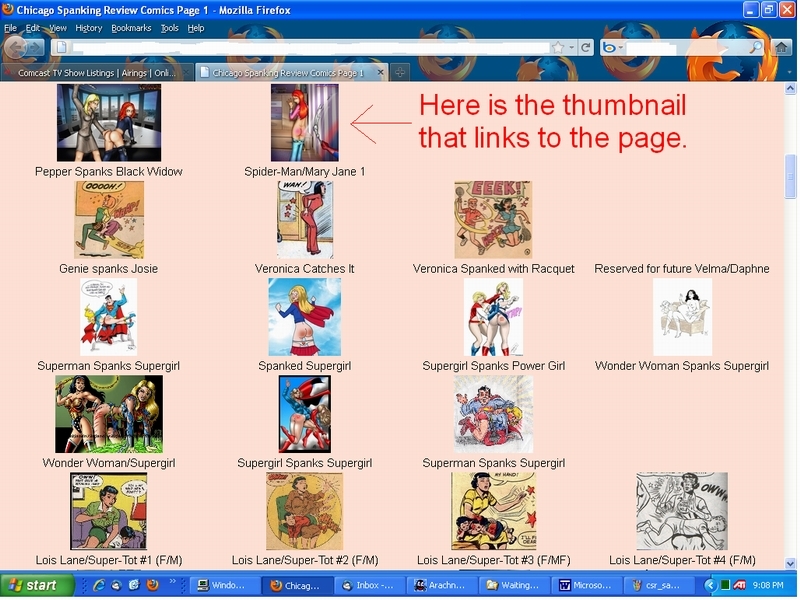 COMICS SPANKING DATA BASE - Searchable, detailed information on every spanking from comic books and comic strips we can find. Also has links to those spankings that may be found here at CSR. DOCTOR CYLON'S WORLD - And a strange world it is, filled with spankings and red bottoms! [spanking art] Colorings and animations of the good Doctor. EVENTS in the scene Just what it says. FICTION - Stories by Helena, Valorie, Leilani, Doc Cylon, JimC, Jules, and John Feer! Just what it says. PICTURE GALLERY - Looking at a few good pics [spanking photos and art] Wide variety of pictorial matter. HUMOR GALLERY - Looking for a few good laughs [spanking photos and art] A funny version of the Picture Gallery. LINKS to some spanking websites worth knowing about External links. FOR DESERVING WOMEN - Press the red button to get Spanked by the Web-Ed! Return Links to the Home Page and the relevant Index Page are provided at the bottom of each Individual Page. Most sites have them at the top, but since the bottom is where you wind up when you're finished reading a page, that's where I put them for CSR. Some Individual Pages have Previous and Next buttons as well. I use these within a series of related pages, for example "Batgirl Hits Bottom" where every one revolved around Batgirl taking the hits on her bottom, but you can always get by without them. Recently, I've begun adding return links to the Home Page and the relevant Index Page at the top of each page as well. This should make things even easier for those who perhaps have arrived at the wrong page and don't want to scroll all the way to the bottom to find the return links. This only applies to newer pages (fall 2011 and later) because I'm not going to retrofit hundreds of older pages.